We now have two high-definition fly-around videos of the Visual Model of Paul’s Churchyard.Both these videos can be viewed in full high definition HDTV format (1080 lines of vertical resolution). For the full effect, when you get to the video, click on the toothed wheel icon on the bottom of the YouTube screen, choose 1080 HD, then choose full screen viewing. The newest one combines Joshua Stephens’ Visual Model of Paul’s Churchyard with Jordan Gray’s renderings of this model to show conditions of weather, season, and age to the model. This video is used in the installation of the Virtual Paul’s Cross Project at NC State University’s James B Hunt Library. It is about 5 minutes long. You may see this video by clicking on the image of Paul’s Gate, above, or by clicking HERE. 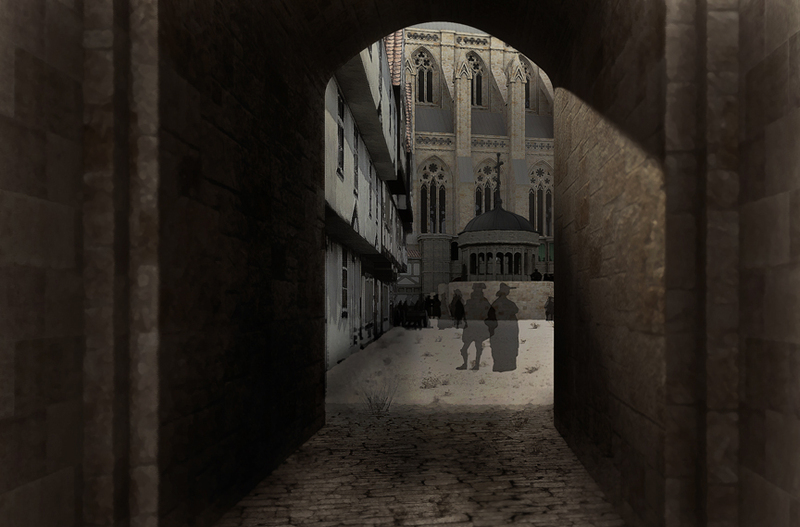 The second fly-around video shows Joshua Stephens’ Visual Model of Paul’s Churchyard in its pristine state. To see this version of the Visual Model of Paul’s Cross and Paul’s Churchyard click HERE. This video lasts about a minute and a half.